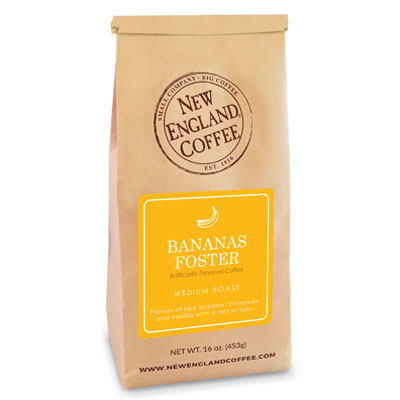 Enjoy the flavors of ripe banana, cinnamon, vanilla and a hint of rum in our Bananas Foster coffee. Delicious taste and sweet aromatherapy! Subtle sweet banana flavor makes for a great hot cup of coffee, or iced. Please make Bananas Foster a permanent flavor. Love the banana foster coffee. Probably one of my favorite flavors. I agree with the previous reviewer, please make bananas foster a permanent flavor! My daughter and I love this flavor! Please make bananas foster available year round. It’s our favorite! I need this back in my life please. Please make available ASAP. You have several customers asking to buy it and it seems to be a very popular flavor. I want you to take my money in exchange for this coffee but you won’t allow me too!!! I read the reviews on this coffee flavor and decided to try it and all I can see is everything that was said is true and more. This is absolutely the best and it is wonderful as an iced coffee. You cannot go wrong with Bananas Foster and they can add me to the list of customers who hope New England Coffee will make it a permanent selection. I just ordered a bag and am getting ready to order several more. Try it you will like it. Our absolute household favorite, and we have to stockpile it when available to make it last. Please, please consider adding it to the year-round selections! I get Banana Foster coffee at the gas station. I love it. Please make this into K-cups and make is a permanent flavor.